Prior to going into dentistry, I worked as a paramedic for six years. I went to California State University, Fresno as a Chemistry major. I graduated from Loma Linda University, School of Dentistry in 1988 with a doctorate and a Bachelor of Science in Human Biology. I am an active member of The American Dental Association, California Dental Association, and The Academy of General Dentistry. I have earned fellowship in both the Academy of General Dentistry and the International Congress of Oral Implantologist. I also administer and volunteer at two dental clinics in Haiti as part of the World Children Relief Organization. I have maintained a private practice in Chula Vista, Calif. since 1990. As a licensed General Dentist in California we work with our patients to achieve and maintain a beautiful smile with healthy gums and teeth. We take the time with our patients to explain their treatment options and inform them of additional preventative care to relieve their stress and anxiety. I have made a personal commitment to always improve my knowledge, skills, and the way I deliver dental care. Since completing my Doctorate of Dental Surgery at Loma Linda University in 1988, I have gone on to receive a Fellowship in the Academy of General Dentistry, a Fellowship in the International Congress of Oral Implantologists, and I am currently working on completing work at the Las Vegas Institute for Advanced Dental Education. These experiences have given me a greater ability to enjoy my profession, and to offer you an uncompromising quality of care. 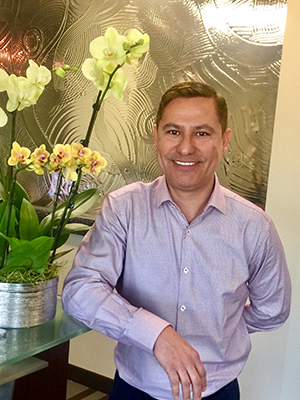 Jose has been our front office coordinator for the past 7 years, he loves providing the most outstanding customer service for all our patients. Over the years he has been able to master all aspects of dental insurance and financing so he can help our patients to achieve all their dental needs. 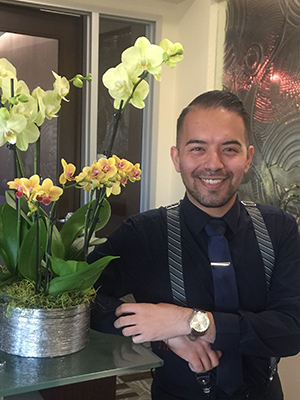 Jose takes care of dressing up our office, so if you have any questions about our flower arrangements or other décor items he will be more than happy to talk to you about his creative ideas. When he is away from the office, Jose loves to entertain friends and family, and cooking is his passion. Laura joined the practice of Dr. Littlefield in September of 2017. She was born in Los Angeles and raised in San Diego. Laura enjoys working in the dental field because she feels it is very educational and she learns new things daily. She loves the staff here at Dr. Littlefield’s office. Eventually, Laura would like to return to school so that she can further her education. When she’s not at the office, Laura likes to spend family time with her husband and children – they do family night and go to the movies along with dinner. She also enjoys reading, baking and spending time with her dog, Benji, at the park. Jose has been working with Dr. Littlefield since 2017. He was born and raised in San Diego and attended San Diego City College and studied psychology and child development. Jose has always found the dental field to be of complete fascination. He is a firm believer in “if you learn one new thing a day, it isn’t a day wasted”. Since working with Dr. Littlefield, Jose has learned several new skills and techniques and has expanded his knowledge in the dental field. As the Hygiene Coordinator, Jose strives to provide his patients with the best information regarding their oral hygiene and keep them up to date with their appointments. Jose loves coming to work and enjoying all the laughter and knowledge Dr. Littlefield and the staff have so generously bestowed upon him. When not at work, Jose likes to read personal development books as well as spend time with family and friends. Marla has over 20 years of experience as a dental hygienist. 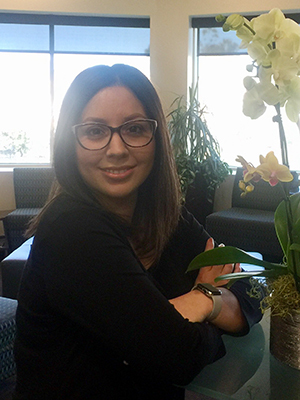 Native to Chula Vista, she graduated from the West Los Angeles/UCLA Hygiene Program, and is experienced in General Dentistry, Periodontics, and Prosthodontics. Marla is certified in radiology and CPR and values continuing education. She reads the latest dental journals so she can provide the most up-to-date dental care information to her patients. When she’s not at the office, Marla enjoys watching her three boys during all their extra curricular activities. They are very active at the South Bay Hockey League.